He fights hard to hide his biggest secret. Ryan Kidd isn't sure what is worse: the injury that ended his Major League Baseball pitching career or being "volunteered" to be the Barefoot Bay Bucks' contestant in a charity dance competition. Things get complicated when his heart throws him a curve ball and he falls under the spell of his teacher, Amara Perez. 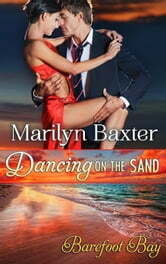 They are supposed to dance the tango, but Ryan finds himself wanting to waltz into her heart instead. However, when the secret he fights hard to keep hidden puts Amara's life in jeopardy, does he continue to two-step around the issue or face it head on? Will his secret risk her life? For Amara Perez the opportunity to participate in a TV-style dancing competition held at Casa Blanca Resort & Spa is a godsend. In addition to providing publicity for Allegro, the dance studio where she teaches, the prize money could help fund a cause close to her heart – adult illiteracy. Amara is determined to dance away with first place, but will her celebrity partner, former Major League Baseball pitcher Ryan Kidd, dance away with her heart before the end of the competition?